NOAA ENSO expert: "odds for a two-year (La Niña) event remain well above 50%" | Watts Up With That? NOAA ENSO expert: "odds for a two-year (La Niña) event remain well above 50%"
The views expressed are those of the author and do not necessarily represent those of NOAA. El Niño/Southern Oscillation (ENSO) is the most important coupled ocean-atmosphere phenomenon to cause global climate variability on interannual time scales. Here we attempt to monitor ENSO by basing the Multivariate ENSO Index (MEI) on the six main observed variables over the tropical Pacific. These six variables are: sea-level pressure (P), zonal (U) and meridional (V) components of the surface wind, sea surface temperature (S), surface air temperature (A), and total cloudiness fraction of the sky (C). These observations have been collected and published in COADS for many years. The MEI is computed separately for each of twelve sliding bi-monthly seasons (Dec/Jan, Jan/Feb,…, Nov/Dec). After spatially filtering the individual fields into clusters (Wolter, 1987), the MEI is calculated as the first unrotated Principal Component (PC) of all six observed fields combined. This is accomplished by normalizing the total variance of each field first, and then performing the extraction of the first PC on the co-variance matrix of the combined fields (Wolter and Timlin, 1993). In order to keep the MEI comparable, all seasonal values are standardized with respect to each season and to the 1950-93 reference period. The MEI is extended during the first week of the following month based on near-real time marine ship and buoy observations (courtesy of Diane Stokes at NCEP) summarized into COADS-compatible 2-degree monthly statistics at NOAA-ESRL PSD. Caution should be exercised when interpreting the MEI on a month-to-month basis, since the input data for updates are not as reliable as COADS, and the MEI has been developed mainly for research purposes. Negative values of the MEI represent the cold ENSO phase, a.k.a.La Niña, while positive MEI values represent the warm ENSO phase (El Niño). You can find the numerical values of the MEI timeseries under this link, and historic ranks under this related link. You are welcome to use any of the figures or data from the MEI websites, but proper acknowledgment would be appreciated. Please refer to the (Wolter and Timlin, 1993, 1998) papers (NOW available online as pdf files! ), and/or this webpage. How does the 1998-2000 La Niña event compare against the seven previous biggest La Niña events since 1949? Only strong events (with a peak value of at least -1.2 sigma) are included in this figure. Note that some events last through the full three years shown here (for instance, 54-56), while others revert to “normal” or El Niño conditions by the second or third year (especially in 64-66). The 1998-2000 La Niña does not resemble any previous event in this comparison figure. It started late (about three months later than the previous latest case), and it featured a superimposed annual cycle (peaking around May and troughing around November) that does not match the other events displayed in this figure. However, the weak La Niña period after the 1982-83 El Niño had similar characteristics. Click on the “Discussion” button below to find the comparison of 2010 MEI conditions against several strong La Niña events. How does the 2002-04 El Niño event compare against the seven previous biggest El Niño events since 1949? Aside from 2002-04, only strong events (with a peak value of at least +1.4 sigma) are included in this figure. The 2002-03 El Niño event peaked below that threshold, with just over +1.2 sigma in early 2003. Overall, I would rank it just barely in the top 10 El Niño events of the last half century. In its evolution, it bears some resemblance to the 1965-67 event (highest temporal correlation), but shared with 1991-93 its reluctance to drop below the zero line once it had run its course. The El Niño event of 2006-07 reached a similar peak as the 2002-03 event, but lacked ‘staying power’, and collapsed in early 2007. The most recent event (2009-10) will replace 2002-03 in this comparison figure by the middle of 2011. Click on the “Discussion” button below to find the comparison of 2010 MEI conditions against several strong La Niña events. The six loading fields show the correlations between the local anomalies and the MEI time series. Land areas as well as the Atlantic are excluded and flagged in green, while typically noisy regions with no coherent structures and/or lack of data are shown in grey. Each field is denoted by a single capitalized letter and the explained variance for the same field in the Australian corner. The sea level pressure (P) loadings show the familiar signature of the Southern Oscillation: low pressure anomalies in the west and high pressure anomalies in the east correspond to negative MEI values, or La Niña-like conditions. Consistent with P, U shows positive loadings along the Equator, corresponding to easterly anomalies near the dateline. Negative loadings in the far western and eastern Pacific, as well as to the south of the positive loading center, show that westerly anomalies are almost equally pervasive in these regions during La Niña. The meridional wind field (V) features high negative loadings north of the Equator, denoting the northward shift of the ITCZ so common during La Niña conditions, juxtaposed with even stronger positive loadings northeast of Australia. Both sea (S) and air (A) surface temperature fields exhibit the typical ENSO signature of a wedge of positive loadings stretching from the Central and South American coast to the dateline, or cold anomalies during a La Niña event. They are flanked by negative loadings (warm anomalies during La Niña conditions) to its southwest and, to a lesser degree, to its northwest. At the same time, total cloudiness (C) tends to be decreased over the central equatorial Pacific and on the northeastern flank of the South Pacific Convergence Zone (SPCZ), sandwiched in between increased cloudiness north of Australia and the eastern-most equatorial Pacific. Now just past its annual peak, the MEI explains 31.6% of the total variance of all six fields in the tropical Pacific from 30N to 30S. Although its temperature components dominate the MEI with over 40% of their possible variance, even P, V, and C join in with about a third, a quarter, and a fifth of their variance, respectively, at or close to their peak values during the year. Thirteen years ago, when the MEI was introduced to the Internet, the explained variance for Dec-Jan 1950/51-1997/98 peaked amounted to 32.7%. This slight drop-off reflects the diminished coherence and importance of ENSO events in the last 13 years, bottoming out just two years ago with 30.9%. The loading patterns shown here resemble the seasonal composite anomaly fields of Year 1 in Rasmusson and Carpenter (1982). Consistent with full-blown strong La Niña conditions, all of the key anomalies in the MEI component fields that exceed or equal one standard deviation, or one sigma (compare to loadings figure), flag typical La Niña features, while no comparable El Niño-like features reach the opposite one sigma threshold. Significant negative anomalies (coinciding with high positive loadings) denote strong negative sea level pressure (P) anomalies over the Maritime Continent (down to -3.2 standard deviations west of Australia), significant easterly anomalies (U) along the Equator and centered on the dateline, significant northerly anomalies east of Fiji, while both sea surface (S) and air temperature (A) anomalies continue at or above -1 sigma in the central and eastern tropical Pacific basin. Significant positive anomalies (coinciding with high negative loadings) denote significant positive sea level pressure (P) anomalies over the eastern subtropical Pacific, significant westerly anomalies (U) along the Pacific coast of Mexico, as well as over western Indonesia where they reach +3.4 sigma, significant southerly anomalies (V) are found west of Hawaii, and northeast of New Guinea where they reach +2.1 sigma, warm sea surface (S) and air temperatures (S) reach almost two sigma east of Australia and west of Hawaii, and significantly increased cloudiness (C) covers the western Pacific and the eastern-most equatorial Pacific where it reaches +2.3 sigma. Again, all of these cardinal anomalies flag La Niña conditions. The only missing key anomaly is cloudiness over the central equatorial Pacific (which should be suppressed, but is not). Go to the discussion below for more information on the current situation. If you prefer to look at anomaly maps without the clustering filter, check out the climate products map room. In the context of the rapid transition of the MEI into strong La Niña conditions, this section features a comparison figure with strong La Niña events that all reached at least minus one standard deviations by June-July, and a peak of at least -1.4 sigma over the course of an event. The most recent moderate La Niña events of 1998-2001 and 2007-09 did not qualify, since they either did not reach the required peak anomaly (the first one) or became strong too late in the calendar year (both). The updated (December-January) MEI value has strengthened slightly to -1.62 standard deviations after almost dropping below -2 standard deviations in August-September. Nevertheless, the most recent value ranks 2nd for this time of year, clearly below the 10%-tile threshold for strong La Niña MEI rankings , but slightly weaker than the value recorded in 1974. If one were to take the average of all MEI rankings since July-August (a six-month period), the strongest La Niña half-year periods of mid-55, ’73-74, and late ’75 averaged slightly stronger than the current event, for now (this is means Rank 4 for the current event, up one from last month). Negative SST anomalies are covering much of the eastern (sub-)tropical Pacific in the latest weekly SST map. Many of these anomalies are in excess of -1C. For an alternate interpretation of the current situation, I highly recommend reading the latest NOAA ENSO Advisory which represents the official and most recent Climate Prediction Center opinion on this subject. In its latest update (6 January 2011), La Niña conditions are expected to last “well” into the Northern Hemisphere spring of 2011. There are several other ENSO indices that are kept up-to-date on the web. Several of these are tracked at the NCEP website that is usually updated around the same time as the MEI, not in time for this go-around. Niño regions 3 and 3.4 showed persistent anomalies above +0.5C from June 2009 through April 2010, with a peak of +1.6C for Niño 3 and +1.8C for Niño 3.4 in December 2009, only to drop to about -0.5C or lower in both regions by early June 2010, reaching just shy of -1.0C for the month of July, and near -1.5C since October for both Niño 3 and 3.4 anomalies. One only has to go back to the La Niña winter of 2007-08 to find seasonal Niño 3.4 anomalies that were lower than this year’s, hence the reluctance of Niño 3.4-based classifications to call this event a ‘strong’ event. Nevertheless, the weekly SST anomalies in January 2011 were consistently at or below -1.5C, so that the three-month average should ‘qualify’ for the strong category based on Niño 3.4 SST. For extended Tahiti-Darwin SOI data back to 1876, and timely monthly updates, check the Australian Bureau of Meteorology website. This index has often been out of sync with other ENSO indices in the last few years, including a jump to +10 (+1 sigma) in April 2010 that was ahead of any other ENSO index in announcing La Niña conditions. After a drop to +2 in June, July rebounded to +20.5, followed by values between +16 (November) and +27 (December), including +20 in January 2011. The last time that this index showed higher values for the average of any six months was during the same half-year in 1917(! ), so any SOI-based classification would classify this event as one the second-strongest event of the last century. An even longer Tahiti-Darwin SOI (back to 1866) is maintained at the Climate Research Unit of the University of East Anglia website, however with less frequent updates (currently through March 2010). Extended SST-based ENSO data can be found at the University of Washington-JISAO website, currently updated through May 2010 (which ended up just slightly below the long-term mean value). Stay tuned for the next update (by March 5th) to see where the MEI will be heading next. While La Niña conditions are guaranteed well into 2011, it remains to be seen whether it can rally once more to cross the -2 sigma barrier, and/or whether it will indeed last into 2012, as discussed six months ago on this page. I believe the odds for a two-year event remain well above 50%, made even more likely by the continued unabated strength in various ENSO indices. Rasmusson, E.G., and T.H. Carpenter, 1982: Variations in tropical sea surface temperature and surface wind fields associated with the Southern Oscillation/El Niño. Mon. Wea. Rev., 110, 354-384. Available from the AMS. Wolter, K., 1987: The Southern Oscillation in surface circulation and climate over the tropical Atlantic, Eastern Pacific, and Indian Oceans as captured by cluster analysis. J. Climate Appl. Meteor., 26, 540-558. Available from the AMS. Wolter, K., and M.S. 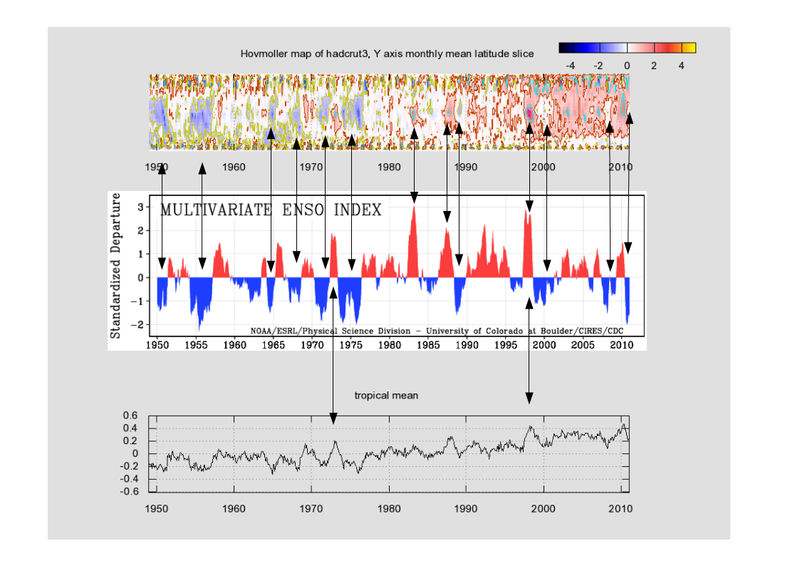 Timlin, 1993: Monitoring ENSO in COADS with a seasonally adjusted principal component index. Proc. of the 17th Climate Diagnostics Workshop, Norman, OK, NOAA/NMC/CAC, NSSL, Oklahoma Clim. Survey, CIMMS and the School of Meteor., Univ. of Oklahoma, 52-57. Download PDF. 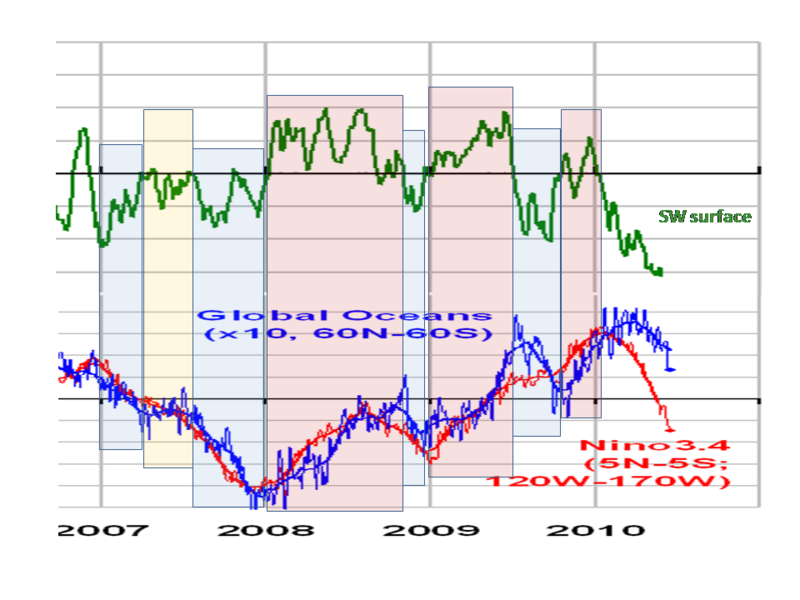 Wolter, K., and M. S. Timlin, 1998: Measuring the strength of ENSO events – how does 1997/98 rank? Weather,53, 315-324. Download PDF. The only missing key anomaly is cloudiness over the central equatorial Pacific (which should be suppressed, but is not). Ok, that would be a major big deal. Normally during a La Nina, there are fewer clouds so the ocean actually gains energy but stacks it up in the Western Pacific Warm Pool and Indian Ocean. I noticed a week or so ago that these areas were oddly cool for a La Nina year. This would explain why. In fact, I wonder … was the 1998 El Nino anomalously clear? If that were the case it might explain why the “step up” in temperature after that event. And with this event being anomalously cloudy, we could be in store for a “step down” after this La Nina. So 2010 was a strong La Nina year which is contrary to what a lot of the pundits here have been saying. This could then be a cold year with massive crop failures and multiple cold weather extremes. May we even see a full year negative temperature anomaly ? If you haven’t already checked out joe bastardi, give him a look. He is genuinely concerned that the next two or three winters will be very cold. And you investor types, buy wheat/ grain futures and energy company shares..The really smart ones will be buying non marginal arable land. Buckle up folks, we are in for a really wild ride! The ‘COADS’ link in the first paragraph does not work- did the author mean ICOADS? Do I detect a thirty-year cyclical signal here? Up to 1976, the pattern dominated by cool La Ninas, then 1976-2006 the pattern dominated by warm El Ninos, now swinging back again? MMn please sun awaken and drive away the clouds. > to what a lot of the pundits here have been saying. That is a disingenious (mis)interpretation. Ther was an El Nino during the 4th quarter of 2009 and the 1st quarter of 2010. There is currently a La Nina that started in the 3rd quarter of 2010, and is still going strong. Note also that ENSO is a “leading indicator” of global temperature anomalies, by a few months. So anomalies peaked around mid-2010 and are still falling. > 2nd quarter of 2013. And the next major peak will be late 2014. That was over a month ago as a Christmas day prediction. > pattern dominated by warm El Ninos, now swinging back again? ICOADS is often referred to as COADS. You mean their wonderful super models (computer type not girls) can’t predict La Niña and El Niño. Quel surpris. Toos a coin and you get 50-50. Wow a cheap super computer; a coin. You see Dr David Whitehouse made this statement in an article here a few days ago. What would motivate him to say that when data presented here suggest it wasn’t an El Nino year? Sure ’nuff. Obvious if you’re looking for it. Thanks to Anthony & Klaus for such an interesting analysis. One of the things that I find of interest is the periods that do not “fit” in to the most common tracks. In the first top 7 chart the end of 70-72 being much higher than the rest at the end and 64-66 being much higher in the middle. Then again in the last of the charts 64-66 much higher in the middle , it would seem to be out of step with the rest of tracks. 70-72 again ends much higher than the rest as well. This whole argument about what is happening during “years” seems silly to me. A year is defined by mankind as return to an arbitrary date for man’s convience, not based upon what Gaia is doing. Shouldn’t discussions about climatic data be based upon Gaia’s orbit, not mankind’s self-indulgent, arbitrary calendar? Perihelion and Aphelion and candidates for end/beginning of Gaia years. Others could likely come up with other suggestions. The 2009/10 El Nino ended in 2010. The impacts on global temperatures typically lag NINO3.4 SST anomalies by 3 to 6 months, depending on whether you’re discussing surface temperatures (3 months) or lower troposphere temperatures (6 months). Since ENSO events peak during boreal winters, it’s always best to describe them with the both years (or all years for multiyear events0, such as the 1997/98 El Nino and 1998/99/00/01 La Nina. It eliminates the confusion, but few people do it. Bob – do you think this could be down the cloudiness factor that Crosspatch mentions? If solar energy is not able to compensate for the oceanic release of heat, then it seems that a temperature stepdown of some kind might well be expected; that assumes the cloud cover situation continues. oceanic heat release from the previous el nino I mean. I would like to thank Klaus Wolter, Anthony and all the commentators for this very interesting post. The subject is fascinating especially the implications about cloud cover. It will be very instructive to watch how this develops. There is either going to be a double-dip La Nina, an El Nino or neutral conditions. Sounds like a Met Office forecast but might be an accurate description of conditions right now. There is so much cool water at the surface (mainly towards the central and centre-west Pacific) and in the subsurface in the eastern Pacific that it will eventually recirculate back into the ENSO regions and cause another La Nina. On the other hand, there is very (near record) warm water below the surface in the western Pacific that is moving east in the Equatorial Pacific Under-Current and it will surface at the Galapagos Islands in about 6 to 8 months and cause what might be a very large El Nino. On the other hand, these two offsetting influences could just battle it out and neutralize each other’s warm/cold water and we will end up with a neutral ENSO for a year or so. All of these scenarios have happened before when conditions were like this. http://www.drroyspencer.com/library/pics/PDO-index-since-1900.jpg When the PDO is in its warm phase, El Ninos become more frequent and generally stronger than La Ninas, while a cool PDO phase is dominated by multi-year La Nina events. It is possible that the recent warm phrase has ended recently, and we are experiencing a ‘Great Pacific Climate Shift’, like in the late 1970’s. Strangely, the shift from cool to warm PDO mode coincides with a similar shift in late Stephen Schneider’s opinion on the direction of temperature change. He used to think that we are heading to an ice age caused by anthropogenic sulphate emissions. Yup. According to Pavlakis et al (2008), downward shortwave radiation can rise as much as 40watts/sq meter during a La Nina. And if the cloud cover hasn’t reduced to allow this, then the La Nina won’t recharge as efficiently. And the reason we aren’t concerned about the decrease in DSR during El Nino events is because the El Nino is releasing heat at the time. Thats exactly what we don’t want to happen. If we are to beat this madness, we need a prolonged period of cooler temperatures so as to demonstarte that rising CO2 levels are not driving the temperatures, but rather natural variations predominantly determine what is going on. A prolonged period of cloudiness would additionally suggest that a likely reason why ocean temperatures had increased over the recent past was due to less cloudiness. One problem we have in this debate is the lack of evidence/data detailing how cloudy the Earth has been over the thermometer instrument record period so we do not know whether cloudiness is a better explanation for any ‘observed’ temperature changes in the various data sets. I for one am hoping for a 2 year La Nina and hopefully coupled with cloudy conditions so as not to recharge the Western Pacific Warm Pool and Indian Ocean. So this is how the NH will look for the this winter and the next one? The heat must be unbearable. If we throw into the pot a less active sun, this may additionally cause temperatures to remain cool. That cloudiness discrepancy fits my propositions set out elsewhere. When the sun is active the polar vortices shrink allowing the tropical air masses to expand. The result is less cloudiness in the areas concerned (indeed globally because more zonal/poleward jets produce less clouds) and so during a La Nina event a larger proportion of the energy released by the La Nina is replaced by solar input to strengthen the next El Nino. If the sun stays active with smaller polar vortices across several PDO phases then the consequence will be upward temperature stepping from one positive PDO phase to the next. However when the sun is less active the polar vortices expand and the tropical air masses shrink. The result is more cloudiness in the areas concerned (indeed globally because more meridional/equatorward jets produce more clouds) and so during a La Nina event a smaller proportion of the energy released by the La Nina is replaced by solar input to weaken the next El Nino. If the sun stays inactive with larger polar vortices across several PDO phases then the consequence will be downward temperature stepping from one negative PDO phase to the next. and wasnt the 70s Hansen et als re the ice age cometh, and our fault for the Ozone holes? You’re right, but it still feels cynical to wish for a long cooler period (which, unlike warm periods, will be very deadly for maybe millions of people). In 1998 the jets were still very poleward/zonal and the Earthshine projects confirm that global albedo was decreasing in the 30 years previously. Since then the global albedo has been increasing as has total cloudiness and at the same time the jets have been becoming more meridional/equatorward. Similarly the level of solar activity has been declining and the polar vortices have been expanding. Here I show direct correlation between ENSO, PDO and NPG (North Pacific Gateway, the long term natural physical process that climate science decided to ignore). One of the weaknesses of skeptics’ argument — null hypothesis wrangling notwithstanding — is that there does not seem to be a coherent theory that explains the physics and climatology for how non-human factors could combine to explain changes in global temperatures. Sure, there are bits and pieces: the sun, ENSO, some combination. But most of what I’ve read sounds little more than generalized phenomenological explanations rather than comprehensive cause-and-effect physics/ climatology that explains the intermediate data between primary cause (sun) and ultimate effect (global temps). Svensmark comes close, but his explanation seems just a little short in explaining the various climatological phenomena involved. So, Stephen Wilde: Your theory does have that ring of comprehensiveness and coherence. Have you been able to get any “regular” scientist’s attention with it? If it’s any good, someone ought to want to publish something based on it. No? and Wilde above are persuasive. Step down in SST, temp at tropopause to follow eventually but is an ongoing negative feedback. Its those butterfly wings we were discussing a couple of weeks back (BZ reaction, ENSO etc.) – we just jumped from one wing (el Nino dominated) to the other (La Nina dominated) of the Lorenz butterfly attractor. I would expect a double dip La Nina, matching the ones back in the 1950’s, because it seems we are in a similar part of the PDO cycle. In fact that is exactly what I was opening my big mouth about, a couple of years ago. Now, however, the quiet sun has me unnerved. That seems quite a big change from the 1950’s. I am trying out a very simplistic approach to the quiet sun’s effects. I have done my best to read papers written by experts and figure out the mechanics involved, and, as best as I can tell, the smart people have a lot yet to learn. As far as the experts are concerned, there is very little reason for a quiet sun to be cooler. I can only shrug and conclude we don’t know the mechanics involved, but it is. If a quiet sun is cooler, it should effect the land much more swiftly than the seas. It is a little like the difference between day and night: By day the “active” sun heats the land, warm air rises, and you get a sea breeze off the water. By night the “quiet” sun cools the land swiftly, cool air sinks, and you get a land breeze out onto the water. If you take this analogy and run with it, you get continents cooling “more-than-expected” during the winter, and cold air masses pouring out over the relatively warmer seas. What this does is throw a wrench in the forecasts that use the past, for we haven’t seen a situation quite like this in the past we have good records for. Cold continents also force the jet stream to dip down around the pools of cold air, and then swing up when they get to the warmer seas, which makes for the sort of loopy pattern that creates “blocks,” and so forth. Most worrisome to me is the peculiar correlation some draw between a cool pattern and the creation of warm El Ninos. There apparently is immediate cooling after a big volcano, but later the cooling brings about a backlashing El Nino. When two big volcanoes pop off with the proper timing, (such as El Chitton and Pinatubo,) the El Nino can be especially large. If there is any truth behind this supposition, than I see no reason why a quiet sun wouldn’t have the same effect. This would throw a huge wrench in my assumption that we are in a cycle similar to the 1950’s. Rather than the double-dip La Nina I expect, a cooling-induced El Nino would occur. Personally I feel our climate has a huge inertia and is very hard to it throw out of whack, for it involves balances and counter-balances, with every reaction creating an equal and opposite reaction. Thus warming sets off cooling, and cooling sets off warming. If men think their petty, tiny actions can effect the grand scheme of the earth’s actions and reactions, and that therefore men can change the weather, I think it is far more likely to happen via rain dances and prayer meetings, than via taxes and power-grabs. Seems a safe prediction, keeping our options open! Apart from those three, what else could happen? An apparent stability of climate over a century-millenial scale is a feature of interglacials such as the present one. When considering climate “inertia” its worth remembering that during glacial periods you have much less stability and very large temperature swings in as short as a few decades – such as the Dansgaard-Oeschger events. There is not necessarily always that much climate inertia. Thanks. The reasoning is already published in various articles in the blogosphere and I’m just waiting for real world events to verify it (hopefully). This cloudiness discrepancy from what is normally observed is just what my hypothesis would have expected. Likewise Joanna Haigh’s observations that ozone increased above 45km during a period of quiet sun is just what it would have expected despite such an increase being contrary to expectations. That is important because we need to see warming higher up to weaken, flatten and spread the polar vortices. That is not supposed to happen with a quiet sun. One of the weaknesses of skeptics’ argument — null hypothesis wrangling notwithstanding — is that there does not seem to be a coherent theory that explains the physics and climatology for how non-human factors could combine to explain changes in global temperatures. Huh? You mean that before us humans came along there were no changes in global temperatures? Now, that really sounds like a weakness in the AGW by CO2 argument! The majority of our cold and snow temperature extreme records are from the 1950s. I do not look forward to the potential to finally break some of those old records, if La Nina persists through 2011 and beyond. The arguments of warmists like JP Miller and PeterT increasingly appear to attempt to convince people that droughts, flood, cold, hot, hurricanes, melting ice, receding glaciers, advancing ice, snow, no snow, etc., etc. are all due to manmade global warming, as if these things never happened before. This is not science. Now it may be true that a single forcing could in fact cause two seemingly diametrically opposed effects, however, unless these effects can be predicted and logically explained, then the argument is more propaganda than science. For science to be useful, it must be able to make accurate predictions. Stephen Richards’ comment above about failure of models to predict EN LN is very telling. So there is cool La Nina and no heat recharge up to now due to increased cloudiness in vital area. Looks like the missing link in Bob T. ENSO theory – that Nino warms and Nina prepares for another Nino in never ending step rise. You seem to imply that your lot have a “coherent theory” that we deniers recognize and accept, but, because we are inveterate deniers, we just can’t help but make up incoherent alternate theories, out of sheer perversity. Perhaps, all you meant was “I disagree”. Since I can do this I have thrown together two other ways to visualise ENSO and perhaps other composites relating to the whole earth data. I hope this helps. Links are at the end of this post. An explanation of what I have done and what it is, otherwise is might take a moment to work it out. An Hovmoller diagram is very simple. We are dealing here with a multiple dimension dataset where visualising on a sheet of paper is difficult. Mapping four dimensions to three is done by calculating a vertical strip for each month, the north/south temperature profile, and lay them side by side. The result is a spatial temperature map. The temperature data is double sine() weighted. Using a single sine() weighting is correct as part of a gridded to sphere mean calculation, but the earth has small temperature deviations at the equator and highest at the poles, it does not work very well, hence what I have done. Could this be done for 1850 to date? Of course but the sparse data and overall temperature variation can this confused. Warning: is a very wide image (8192 pixels) and might cause browser problems. JP Miller doesn’t get it. “It” being the scientific method, which utilizes the null hypothesis [which Miller also doesn’t understand]. Scientific skeptics have nothing to prove. We point out contradictions in the repeatedly falsified CAGW conjecture. That is the job of skeptics, and the only honest scientists are skepticals. Miller swallows the cAGW story hook, line and sinker – and then demands a “coherent theory”. He doesn’t get the fact that skeptics have nothing other than the null hypothesis to support them. In fact, such apparently simple conjectures as climate sensitivity are unknown. What is known is the fact that the catastrophic global warming due to CO2 conjecture has been repeatedly falsified. Skeptics have done their job by debunking the “carbon” claim. It’s time for the alarmist crowd to man-up and admit that they cannot show any global harm due to CO2. I think you have things backwards. Sceptics have been saying for a few decades that the “science isn’t settled”. But, all along it has been the Alarmists led by Gavin, Hansen, Trenbeth, ALGORE, et als that the science is settled, for they possess the Truth! Oh Happy Day! Your little strawman was clever, but I don’t anyone here is falling for it. Sceptics are actually doing real science and offer various theories and ideas. But no one has been able to come up with some comprehensive Unified Field Theorem for Climate (if one even exists). BTW, there are several private meteorologists who with a very good deal of precision can forecast temperatur and precip anomalies for +12 months out. And none use the Greenhouse Gase Theories to support thier medium range climate projections. In any event, for quite a few years there have been private meterologists who in public argued that the Alarmists were wrong – they were cast out into the darkness. But, they were proven correct. Our atmosphere is a bit more complicated than the Team suggests. I have commented to excess on the importance of lunar declinational tides in the atmosphere, in reference to the driving effects on the balance between zonal flows and meridional flow surges developed from different parts of the 18.6 North/South declinational patterns produced in the global circulation patterns. Most of you no longer pay any attention to my posts. As a result I have not posted as much nor as often lately. that the average person can grasp in much more detail in much less time. The differences in the repeating cycle forecast post to my web site from the current weather is IMHO due to the less active solar cycle now compared to the past three. Revision from the beta passive forecast method I now use to an interactive interface process is in the works, now that I have time and some money to pay to get the developmental changes done. I am trying to make a compilation of the many ideas of how the null hypothesis works as put forward by the posters on this site, and others and have been excising posted comment from threads to stitch together with segments of how I think it interconnects. Edits are now being made, and results should be viewable in the coming months. The forecast maps on my website have attracted the attention of Eric Floehr of “ForecastWatch” copies of the CSV files I used to generate maps from March of 2010 through January 9th of 2014, have been sent, for his use in evaluating the effective accuracy of the beta forecast process I currently use, and also to assist in development of revisions in the method used into an improved method. I have already in the works several modifications to add to the process, along with projects to help others visualize the lunar tidal effects, I can see driving the cyclic oscillations in the global circulation. I am hoping that through “extended peer review” processes the regulars on this blog, and others will contribute to help form a more complete view of the Null Hypothesis, to the point that the application of the principles can generate a better long term daily weather forecast out to 15 years into the future. I agree that the desire for a long cooler period will heap misery on millions of people. However, I see this as the lesser of two evils. I do not consider that it is likely that within the next 10 years there will be a significant improvement in the understanding of the underlying science, unless the cloud experiments reveal something interesting. That being the case, the only way to defeat this madness is to see a substantial divergence between observed temperatures and model predictions. It may be that the ‘Team’ can massage the reported temperatures (although with satellite data and ARGO this will become more difficult), but that will not hoodwink the public when it is not possible for the ‘Team’ to hide the snow and increased heating costs due to the cold. We need to slam the brakes on spending trillions of dollars on mitigation of a non problem not simply because of the financial hardship that this will bring to the developed nations, but also because without cheap energy there will be a drastic reduction in the standard of living in the developed countries AND it will curb developing countries from enjoying substantial increases in their standard of living. Why shouldn’t these countries have an opportunity to develop? It is wrong that so many people in developing countries (such as India and Africa etc) are without electricity in this day and age. It is wrong to force these people to endure such poverty and hardship which this Green agenda will certainly impose. In conclusion, I consider the best prospect of slamming the brakes on will be a lengthy and sustained cooler period. Regretfully, this will cause hardship for many but this will be the lesser of two evils. Since I do not like the cold, I shall probably emigrate to some warmer clime. I have checked extended Tahiti-Darwin SOI data back to 1876 at the BOM site (standardised anomaly of the Mean Sea Level Pressure difference between Tahiti and Darwin). No cycles are seen at all, it is plain random walk noise (a.k.a. red, 1/f^2 or Brownian noise). In this case expected departure from average is proportional to square root of time elapsed (that is, it can get arbitrarily large if we wait long enough). I guess this is what’s meant by unforced internal variability of the climate system. For SOI a possible lower cutoff is also seen perhaps, possibly because air pressure differences can’t get arbitrarily large after all. However, the brief statistical analysis I’ve performed strongly suggests an underlying Wiener process with its scale invariant behavior and fake trends. Thanks for your viewpoint. I was hoping you’d comment on this one. I always stop and read when I see your name as I am scrolling through a thread. I don’t know, I think el nino by the fall is more likely than a double-dip la nina. Look at the recent CPC page heat content is already on the move eastward with positive subsurface temp anomalies already pushing toward the dateline. All these multifarious correlations are a waste of time. Looking at the satellite temperature curve I could see that the current La Nina should bottom out approximately a year from now, which means during the next winter. If you thought this winter was cold wait till the next one gets here. I’d like to comment on the cloudiness point made throughout the thread. There has actually been a massive reduction in the clouds over the Nino regions and especially over the International Dateline region which is where the biggest difference occurs between an El Nino and a La Nina. The equatorial Pacific has been nearly cloud-free for 6 months. This is extremely unusual for an equatorial region. There is some additional cloud over 8N where the equatorial counter-current is and over Indonesia and Australia and India which is a normal situation with a La Nina following an El Nino. In fact, one of the reasons the surface is now warming in the east Pacific is because the lack of cloud means the Sun is beating down, day after day and warming the surface ocean. This is also one of the factors which eventually causes a La Nina or an El Nino to reach a peak and go the other way. This is also one of the factors which explains why a La Nina cause cooling – because the surface ocean is giving up its cooler-than-normal-but-still-warm-equatorial-heat more directly to space without clouds slowing the release. So, the cloudiness comments above are way off base. There is still a possibility the equatorial Pacific could get hit by a rogue stellar black hole in the next 6 months which will make the El Nino versus double-dip La Nina discussion mute. Actually, I think the big red spot at 160E, 150 metres depth will win out and we will have a very strong El Nino later in 2011. I’m 3 for 4 at predictions at this time of the year based on this methodology. Bill, what cloud cover/amount dataset are you referencing, and do you have a link? I assume Dr. Klaus meant what he was saying, he didn’t mention cloudiness last month. It would take me day to digest this. The lesson though is just describing the evolution of weather is too much for the English language. All those guys with their “common sense” and their ” it’s snowing in my back yard, so that means the whole planet is heading for an ice age” don’t have what it takes. It’s the variance, not the mean, that moves with solar variation on decadal timescales, as I have shown here [ http://wattsupwiththat.com/2010/12/23/confirmation-of-solar-forcing-of-the-semi-annual-variation-of-length-of-day/ ]. In that article I focused on semi-annual variations, but it’s an easy step (for anyone with a handle on grain, extent, & integration across harmonics) to figure out that annual power varies inversely with semi-annual power. Leroux, Marcel (1993). The Mobile Polar High: a new concept explaining present mechanisms of meridional air-mass and energy exchanges and global propagation of palaeoclimatic changes. Global and Planetary Change 7, 69-93. The 27 day lunar cycle is modulated by 3.6 & 18.6 year lunar cycles. It would be nice if this is true. But the fact that climate varies a lot without human intervention tells me that it ain’t so. If subtle effects like orbital variations can cause ice ages then the human race ought to be very careful about adding it’s own subtle influences to the mix. E.g. Pielke Snr is pushing both agricultural practices and aerosols as influencing climate. These are plausible influences. If you ever get to visit Asia look up at the sky; you can’t see it. It’s not much better in the USA or Europe. So the hubris argument fails. But what if you are wrong and that it is a problem. Remember we have not seen much warming yet. The temperature can go a lot higher. If this effects agriculture then your standard of living argument fails on the simple principle: you can’t eat a refrigerator. If Earth’s closest approach to the Sun suddenly started occurring in July instead of January (as it does now) then you’d soon be disabused of your notion that orbital variations are subtle effects. There may be some variation in the areas where cloudiness increases and where it decreases when levels of solar activity vary so as to shift the air circulation systems. Currently global cloudiness and albedo is higher than it was during the late 20th century warming period. Essentially you are suggesting that a recharge process is going on whereas Bob Tisdale suggests that the recharge process is failing. I’d like to see that point resolved. Personally, I agree with you comments. How you tried posting your comments at RC or Joe R’s Blog of Horror? The arguments of warmists like JP Miller and PeterT increasingly appear to attempt to convince people that…. Although it doesn’t matter much, let me set the record straight: I am not a warmist, and cannot quite imagine how my comment could be interpreted that way. I said nothing to try to convince anyone of anything other than Stephen Wilde’s theories seem quite detailed and testable, leading me to ask if any scholars had taken it up and investigated it specifically. This has been a very strong La Nina and should double dip, with the second half being weaker. A benign sun should technically produce more low level cloud, which presents an opportunity to prove Sol is not just a bit player. As long as there are no volcanic eruptions to blur falling temperatures, we have a perfect test bed. Wow! Was my comment misunderstood! What I was trying to say, without success, obviously, is that it would be nice to have closely-argued physics and climate-based theory, supported by data, effectively demonstrating climate variation to be the result of non-CO2 factors, (e.g., Milankovitch cycles, TSI, cosmic rays, ozone chemistry, non-man-made aerosols, clouds, ENSO, PDO, AMO, etc., etc.). We don’t have that. We have data and handwaving, which is what most of climatology consists of, warmist and skeptic alike — analogous to epidemeology in medicine. Lots of data and handwaving. Useful science, possibly; just not conclusive. Before I go on, let me state clearly: I’m not convinced those who argue that CO2 is a major contributor to increasing global temperatures have generated data that conclusively reject their null hypothesis. My view, quite simply, is: we need more data and more theories and more analysis. Unfortunately, so little funding goes to research that does not explore the role of CO2, that it is difficult to put together the long chain of linking theories and data needed to reject our null hyupothesis (i.e., increasing CO2 contributes meaningfully to increasing temperatures). I suppose from a public policy perspective it is useful to point out that warmists have essentially argued from ignorance and thus have not rejected their null hypothesis. I don’t think that discussion advances the science or our knowledge much, however. If you ever get to visit Asia look up at the sky; you can’t see it. It’s not much better in the USA or Europe. Get some glasses. I can not only see the sky, but 150 miles on a typical day, in the USA. Is this one to ICOADS a suitable replacement? Just a couple of more charts on cloudiness from the monthly climate bulletin linked by FergalR above. First, the Outgoing Longwave Radiation which is partly a measure of how warm a region is compared to the average Earth but more related to where the clouds were holding the OLR in. The Pacific was way above normal in December, especially the International Dateline area (+50 watts/m2 is a big number). We can also see that Indonesia and Australia and North Indian Ocean were mostly cloud covered in December. Then the precipitation anomalies, an even better measure of cloudiness. Indonesia, Australia and Northern Indian Ocean got dumped on in December. The north equatorial counter-current at 8N also had convection clouds. The equatorial Pacific and especially the International Dateline area saw little if any rain in December. This pattern has been there for about the last 6 months. This is exactly the weather pattern caused by a La Nina. In an El Nino, many of the variables are reversed although one could always expect the patterns to shift by a few hundred kms from event to event and vary in intensity. You are right that we have not seen much warming yet no doubt because because CO2 does not drive temperatures or the sensitivity to CO2 is far less than the IPCC suggest. If I am wrong we simply adapt. There is no fundamental problem to adapting. You cannot grow crops in the antartic but you can grow crops in the desert. However, the reality is that Africa is not the food basket of the world. If it gets slightly warmer there, it will not be an insurmountable problem for food production. The food basket of the world is in the Northern Hemishere. It may be that this will shift marginally to higher latitudes, but again this is not a problem. The point is simple, consider the position where we throw trillions of dollars at curbing CO2 and we pull back the industrialisation of developed countries and we prevent developing countries from inductrialising, only to find that CO2 does not drive tempreratures and notwithstanding a reduction in CO2 levels, the world continues to warm. This warming being due to natural variation. Lets for the sake of argument assume that a warmer world causes severe problems (something I consider incredibly unlikely). We now have a major problem. The problem is: we have already spent trillions of dollars on unsuccessfully mitigating (through reducing CO2 emissions which turned out to be useless). We are now financially bankrupt. Industrialisation in developed countries has been cut back and therefore is not in any event in a position to quickly mobilise resources necessary for adapation. We have prevented the developing world from developing so they too are not in a position to mobilise resources necessary for adaption. So required adaption is now extremely difficult. If on the other hand, we do not spend those trillions of dollars and if we do not hinder industrialisation in developed countries and we allow developing countries to develop, and IF the world continues to warm and IF that warming causes severe problems, we are in a position to easily adapt. We will have the financial means and we will be able to throw the might not only of the present developed nations but also the might of the developing nations which have now developed behind the steps needed to adapt. The history of humankind has shown that as a species we are particularly adept at adapting. Better at this than at mitigating. The ingunity of man will easily overcome any problems that may arise. There is also an additional benefit of the do nothing and adapt policy. First all those in the developing countries will enjoy the benefits which we take for granted. Their standard of living will dramatically improve. Second, if the world continues to warm and if this is beneficial (as I believe it will be), there will be little need to spend any money or resources on adapating (since relatively little adaption will be required) and the whole world will be able to bask in the benefit of a warmer globe. In the meantime we should simply act sensibly. Better manage our water resources, not build on flood planes and adopt less poluting technologies only when properly developed and financially sustainable. I have been to your site. The weather projections seem pretty good. It appears you are on to a piece of the puzzle that is largely (totally?) ignored in the field of weather/climate. Whether you are looking at a first cause, or a symptom of one, it seems important to me. Yes, JP, I was surprised by the reaction since I took it in the way you intended and saw no offence. As regards your query my hypothesis has been developing over time and has been adapted as those who know more than me criticised my intitial propositions. However with each successive adaptation it has been getting closer to real world observations and if this recent cloudiness observation is correct then that is another step forward. I’m waiting to hear Bob Tisdale’s response to Bill Illis’s comment. Bob is clear that the expected recharge is not taking place which is exactly what I would expect with a quiet sun and more equatorward jets. As regards it being followed up by an established climate scientist then I would be only too pleased if that were to happen but it takes time to get noticed and it is early days yet. I think that where Steven makes his mistake with the Stratosphere is in failing to determine what disturbs it from both sides of this ethereal layer. His focus is on external (read “solar”) influences and downward only propagation. However, the Earth’s highly variable and oscillating atmosphere from below is also quite capable of disturbing the Stratosphere above it, which will then propagate this disturbance downward. Stephen, what would have been your solar thesis back in the 50’s when we experienced on-the-ground conditions similar to today? I’m no fan of CO2 caused warming. But I am no fan of a solar driver either. I find this synopsis of a solar-climate connections to be a worthwhile read. LazyTeenager, you are utterly and entirely wrong about global warming being detrimental to agriculture. Every farmer (and I manage a family ranch) I know dreads global cooling. Every one of them. No exceptions. They all wish global warming to continue. All agriculture universities I know spend far more resources instructing students on how to grow a vast variety of crops in warm weather (and always have), and simply state that if your farm is in Minnesota, one should buy yearly insurance against cold weather. Cold weather is detrimental to the production of food. Warm weather enhances it. Case closed. If you read more of my work you will see that I propose a bottom up oceanic influence too with the jets responding to both forces as each ebbs and flows. As regards the mid 20th century cooling period I have already proposed several times that the cool PDO phase offset the effect of the active sun especially during the slightly less active solar cycle 20. Note that I say that the sun pushes or pulls the jets latitudinally from above and the oceans push or pull the jets latitudinally from below. Once the jets shift they affect total cloudiness, global albedo and the net solar energy input to the oceans. I believe that the albedo effect of air circulation system changes is a better solution to the problem than either Lindzen’s iris effect or Svensmark’s cosmic ray effects. I point to the Earthshine project as supporting evidence. Global cloudiness and albedo decreased up to the late 90s and increased thereafter. Around 2000 I noted that the jets were becoming less zonal. The current degree of jetstream meridionality has been building up for 10 years now but only recently has it become obvious to all. Thankyou Pamela Gray for that historical link, it opened my eyes on the climate/sun connection. And the answer is ‘not necessarily’. When the sun changes cloudiness and albedo in the way I have described the effect is very large because the jets seem to move latitudinally some 1000 miles or so latitudinally over the 500 year intervals from MWP to LIA and then to date. So the issue is as to how far a bit more human CO2 would shift the jets. The answer seems to be, imperceptibly in comparison, because the extra CO2 doesn’t participate in the photochemical reactions in the upper atmosphere that lead to a change in the vertical temperature profile. It requires the special physical properties of photons and particles arriving from the sun to do that. The CO2 effects are purely radiative and easily dealt with by a tiny adjustment to the system. The increase in CO2 over the past 150 years seems to have done nothing to offset the cloudiness and albedo effects caused by the changes in solar activity recently whereby the falling trend in cloudiness and albedo up to 1998 or thereabouts was reversed with more meridional jets just as the sun started to become less active and the jets started to become less zonal. I think that recent events are demonstrating that their unexplained discounting of the obvious led them to an incorrect conclusion. Well given that they fully accepted the photochemical nature of the solar effects why did they assume that the purely radiative effects of a bit more CO2 would more than offset it? I think they should be asked for an answer. Which comment? I’ve already replied to his initial comment with a question. I did? Please quote me chapter and verse. How does that fit into your conjectures? OK .. so which is it. SO .. which is it. Is the cloud cover for this La Nina unusual, or is it normal?? Apparently, the inferences some of us drew from your comment were not what you intended to convey. I certainly apologize for mistaking you for a warmer, but I can tell you why I did. It was your implication that the orthodoxy has a theory that appears coherent not only to themselves but also to sceptics. Obviously, if I don’t agree with them, then I think there’s something incoherent in their narrative. Furthermore, characterizing scepticism as flawed if it doesn’t have a complete alternate theory seems an odd demand to place on disbelief. If this was merely an observation on the political level that we will not sway others, then you’re probably right. In the end, however, the proof of the pudding is in the heating, or lack thereof. These people have come to my door selling a product that I’m not buying. I’m sorry for thinking you one of them, although I’m sure they’re all very nice people. 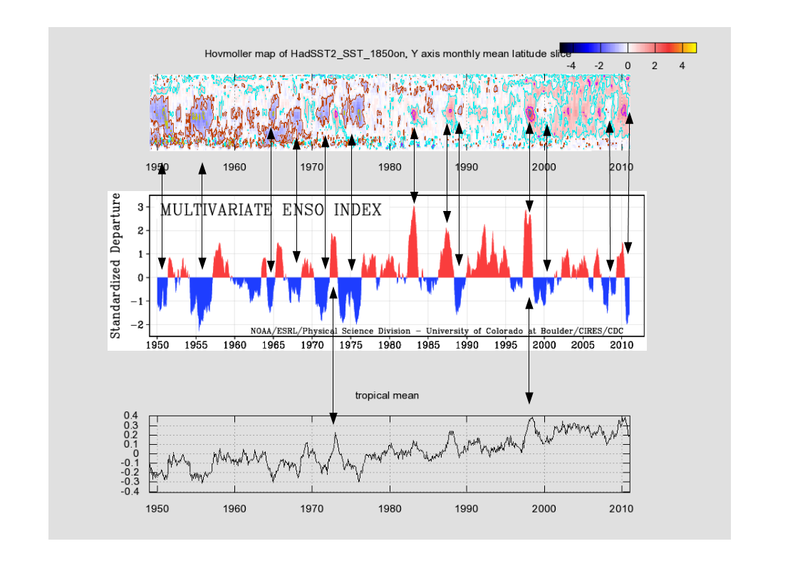 Is there a link for the pre 1950 ENSO monthly or annual data file ? So perhaps I misinterpreted that. If so please indicate whether it has recharged it as much as you would normally have expected by this stage of the La Nina. The sun not being ‘quiet’ at the time of the recharge process for the 1997/8 El Nino should have resulted in less cloudiness and a faster recharge than we are now seeing for the recharge of the 2009/10 El Nino. Do you see any evidence for that ? From your data is cloudiness during this La Nina ‘normal’ or not ? Note that since it is global cloudiness that I consider to be important and not regional cloudiness this specific point is not critical for me but if there is now more cloud than there ‘should’ be in the recharge zones then that would be helpful. As regards global cloudiness being higher than it was I have the Earthshine project on side for that. As regards the issue of poleward/equatorward jets I consider that increased meridionality always results in a net equatorward shift because the main power of the jets is clearly diverted around the equatorward side of the blocking highs simply due to their being more physical space on the equatorward side as a result of the geometry of a globe. Similarly ncreased zonality always results in a net poleward shift. I think it is a given that the jets have become more meridional as the sun has become less active. Stephen Wilde’s speculations are not based on data. He has not attempted to confirm his speculations with data, and he has been presented with data that contradicts his speculations on many occassions. The contradictions are on short timescales whereas longer timescales do throw up correlations that are helpful. For example the air circulation changes between MWP, LIA and the present are consistent with my proposals. Due to limited past data of a suitable nature the best means of verification or rebuttal is close observation of ongoing events. So far, ongoing observations are fitting in well. More meridional jets, increased cloudiness and albedo, a more negative AO, a cessation of stratospheric cooling, a cessation of tropospheric warming, a shift to negative PDO with dominant La Ninas, cessation of rising ocean heat content and a less active sun all starting from the late 90’s and all being a reversal of the earlier late 20th century trends and all being satisfactorily connected by my current climate description. No other current hypothesis links all those observed phenomena in a plausible narrative. Furthermore the unexpected 2004 to 2007 observation that ozone increased above 45km was anticipated by my description which requires warming in the higher levels of the atmosphere when the sun is less active which is the opposite of established climatology. Unfortunately Bob does not accept any of that as ‘data’. Well since it is low level cloud cover that we are concerned about I don’t think precipitation anomalies are a suitable proxy. Thus Bob has no data either way and has not yet answered my questions as to whether the current recharge process is proceeding as quickly as did the recharge process after the 1997/8 El Nino. Although the central equatorial Pacific is not a critical area for my hypothesis it would be useful to know whether the more meridional jets are having any effect on cloudiness in the region. So .. you guys mean to tell me that we have all this fancy satelite technology floating around up there …. We can measure surface temperature, long wave radiation exiting the atmosphere …. but we can’t measure the “cloudiness” of certain regions of the globe???? Heck .. I want my tax dollars back!!! There’s no reason for me to reply to the remainder of your comment due to the error in your opening sentence. ..is contraversial. There are volcanic ash biases in the appropriate years, and up until the late 1990s there was an area in Indian Ocean that wasn’t measured. It also is not maintained on a monthly basis. Stephen Wilde: You have stated on an earlier thread here at WUWT that your “model” only works on multidecadal timespans. Why are you even discussing it on this thread? Did you read Bill Illis’s comments on this thread, Stephen? Or are you cherry-picking specific sentences? He wrote in his February 6, 2011 at 4:28 am comment, “Then the precipitation anomalies, an even better measure of cloudiness.” And I presented the NOAA precipitation data, which you apparently looked at since you’ve linked it in a comment. So is it cloudier than expected or is it not ? Wolter says it is. Bill Illis says it isn’t. Is the recharge happening as fast as it did after the 1997/8 El Nino or is it not ? And how can precipitation be a good proxy for cloudiness when it is low non precipitating clouds that are the issue here ? Bill Illis seems to be relying on a proxy. And I am discussing my model here because I would like to know whether the more meridional jets can alter recharge rates for the ENSO cycle. Meridionality/zonality seems to vary over multidecadal timescales so this is a relevant issue. It is not a critical issue however because I prefer to look at the global oceans as a whole rather than just the ENSO region but if the ENSO region is affected then that is useful to know. Here is the Earthshine project data showing increasing cloudiness and albedo since around 2000 when I first noticed reducing jetstream zonality. So clearly, increased zonality is failing to recharge the oceans as a whole because ocean heat content has been declining since 2003. What I am seeking to ascertain here is whether the global trend is also reflected in a similar trend over the ENSO region. Wolter’s cloudiness observation suggests that it is. Basically, the cloud datasets are contradictory and may not be reliable. The science community doesn’t officially accept the ISCCP or the Earthshine estimates for example. One really big issue is the actual thickness/optical depth of the cloud. On average, the Earth is about 67% cloud covered, but 75% of the sunshine still gets through the 67% clouds anyway on average. The low level, moisture-laden, blue-underneath clouds will catch more of the sunshine that hits them but the higher stratus clouds don’t do much. Then there is the issue of how solar radiation reflected by the surface is just reflected back to the surface again by the clouds. Any cloud that looks white from the surface is, in fact, doing this. Then does anyone know how much IR a cloud will reflect/slow down. What frequencies are the most/least intercepted. And finally, how do we distiguish solar radiation reflected/intercepted by clouds versus solar radiation reflected from aerosols or dust or jet contrails or the invisibility cloaks of UFOs and the UN. The OLR measurements from the satellites might be the most informative information available. Stephen Wilde: If you were capable of entering data into a spreadsheet and plotting it, you wouldn’t have so many questions. I’ve already answered this question and presented a graph of precipitation anomalies as a proxy for cloud cover. These are things you could confirm for yourself if you’d learn how to use a spreadsheet. Then, I will again suggest you learn how to use a spreadsheet, so that you can actually research what is being discussed. Appearances are misleading. You might be fooling yourself and convincing yourself of a relationship when none exists. Have you plotted the earthshine data for the tropical Pacific, which is what is being discussed here? I already know the answer to that, and it’s no. So all you’re doing is speculating. You’ve provided nothing to document your claims. BTW, Global OHC has not declined since 2003. There is a positive trend. It’s significantly less than the trend from 1993 to 2003, but it is positive. First, you need to establish the global trend, which you have not. I’m getting different information from different sources. So forgive me for not accepting you as the final arbiter. I also think that one upmanship on the use and interpretaion of spreadsheets is inappropriate here. Everyone here knows that I am not a professional scientist. However I note subsequent further ‘revisions’. Nonetheless it is quite enough for the validity of my hypothesis that the previous upward trend has become ” significantly less than the trend from 1993 to 2003″. The oceans don’t turn on a sixpence you know. No doubt it will turn downward in due course provided the solar input is reduced by more cloudiness so as to offset more of the recharge process than was the case in the late 20th century when there were less clouds. That Pavlakis paper you kindly referred me to mentions DLR not DSR. So the data source is not fit for purpose. So the low cloud is more important but the data relating to it is inadequate. I seem to have contrary assertions but no way of resolving them. Thanks Bill. That is constructive even if it takes us no further. For the moment I’ll stick with my proposition that more meridional jets with more looping about must increase the length of air mass interfaces to produce more clouds. Whether that increased meridionality spills more clouds into the ENSO region is currently not certain. It would be an important point to resolve though. However more cloudiness globally is enough to support my propositions since the ENSO region though important is only part of the larger global system. I linked two papers by Pavlakis et al on this thread, one on DSR in the tropical Pacific, one on DLR. I linked the one about DSR a second time on this thread personally for you. You even quoted my introduction to the the one about DSR, Pavlakis et al (2008), in one of your replies. I provided you a recent link to the DLR paper, Pavlakis et al (2007), because that’s the paper the discusses that low level cloud amount does not correlate with ENSO. Stephen, it’s not contradictory. They noted that low-level cloud amount does not correlate with ENSO and they noted that this may be due to the uncertainties in the data. Again, I provided you with links to two Pavlakis papers on this thread, one about DLR in the tropical Pacific and one about DSR. Keep in mind that Pavlakis et al (2008) deals with DSR, and that DSR is capable of warming more than the top few millimeters of the ocean surface, and that we’re discussing how cloud amounts and DSR recharge the tropical Pacific during La Ninas. Have you checked which cloud cover dataset he uses for his MEI, and what the problems are with that dataset? Ok, I’m back into the correct Pavlakis paper that deals with DSR and of course it must be the case that more cloud results in less DSR entering the ocean. We’ve all agreed that already. So the general rule is that in that specific area there is less cloud during a La Nina with increased DSR warming the oceans. The recharge process that we are all agreed on. However Wolter says that currently the cloudiness is not being suppressed to the extent one would expect during La Nina. So what are your grounds for contradicting what Wolter is saying ? As regards global cloudiness I have pointed out two sources that show increased cloudiness globally since 1998 so I am reasonably secure on that issue. I just want a bit more openness about the current state of cloudiness in the region where a La Nina would normally suppress cloudiness. And if low level cloud is not linked to ENSO as you say (despite the inadequacy of the data for establishing that fact) then we are back to the cloud amounts being affected by something else and here I suggest that the relevant ‘something else’ could well be the behaviour of the general air circulation system as it pushes cloud into (more meridionality or equatorward jets) or pulls cloud out of (more zonality or poleward jets) the ENSO regions. Furthermore increased jetstream meridionality involving faster equator to pole heat cycling could well provoke intensification of the ITCZ too which would also have an effect on middle to high level cloudiness. So here we have a critical diagnostic feature of the climate system but the cloud quantity data is inadequate, apparently. i) El Nino with increased cloudiness as compared to long term average. ii) El Nino with decreased cloudiness as compared to long term average. iii) La Nina with increased cloudiness as compared to long term average. iv) La Nina with decreased cloudiness as compared to long term average. And each of those scenarios will affect the recharge/discharge process differently and each of those scenarios will be controlled by factors external to the ENSO phenomenon. 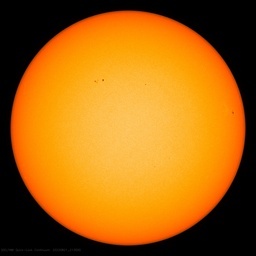 Most likely by solar activity expanding or contracting the polar vortices and shifting all the air circulations so as to affect average cloudiness over ENSO regions regardless of the then current state of ENSO or PDO. Well worth considering in my humble opinion. Stephen Wilde: I assume your last two comments are directed at me. I’m not the person who’s curious about Klaus Wolter’s cloud statement. You are. He’s apparently using a cloud dataset. Have you determined what it is and what its problems are? Apparently not. I explained the problems with the ISCCP cloud amount data in an earlier comment. And if you were to “google scholar” ISCCP, you’ll find 8,000 plus returns, so the scientific community does accept the dataset. Then I suggest you ask someone who shares your concern. I do not. And I base that on the fact that your “current state of cloudiness” has not suppressed the recharge phase of ENSO. I have the ability to download data and plot it and interpret it. You do not. With that in mind, I’m not going to do your research for you. Your paraphrase does not represent what I presented on this thread, Stephen. I did not say, “low level cloud is not linked to ENSO.” I pointed you to a paper that noted that low level clouds were not correlated with ENSO. Tropical Pacific TOTAL cloud amount (including low level clouds) is (anti)correlated with ENSO, and is a function of coupled atmosphere-ocean responses to ENSO, primarily trade wind strength and the location of the warmer water. Conjecture on your part. Please present the data that supports this. Then I suggest you find a cloud cover dataset capable of confirming this. You could then download the data and present something other than speculation. And the dataset that Klaus Wolter uses for his MEI, COADS Cloudcover, shows a significant decrease in global ocean cloud cover from 1998 to 2007. Like I said, the available evidence is contradictory so you are no more ‘right’ than I am. What is certain though is that more meridional jets involve a hugely increased length for the air mass boundaries as they loop about between poles and equator with vastly increased areas of mixing and cloud formation. That is bound to show up in the cloud data and albedo figures once the current data mess has been resolved. You know, Bob, it could be so much better chatting with you if you could refrain from being so rude and acting so superior. Anyone else see what he did there ? But Klaus is referring specifically to the area where one would normally expect a reduction of cloud cover during a La Nina and is saying that such reduction has not occurred to the extent normally expected so how does your comment help ? Given your contention that the recharge is progressing ‘normally’ I wonder whether everyone is comparing apples to apples or apples to pears. Do you agree with crosspatch or not ? Do you have data that supports this? I’m not “acting so superior,” nor am I being rude. I may be writing succinctly and you may be hypersensitive. As I have noted a multitude of times here at WUWT, without data to support your claims, all you’re doing is speculating. Again, have you investigated the ICOADS Cloud Cover dataset used by Klaus Wolter to see if you want to continue pursuing this line of questioning? I do not agree with this portion of Crosspatch’s statement, “I noticed a week or so ago that these areas were oddly cool for a La Nina year,” because the SST anomalies for the PWP are precisely where one would expect them for a La Niña. I am extrapolating from known physical principles and observations. i) The air mass boundaries are obviously longer applying basic geometry. ii) Clouds result from temperature differentials and mixing so more mixing along a longer interface must give more clouds. iii) More clouds generally give a higher albedo. iv) There are data sets which show increased cloudiness and albedo since the late 90s. Call the obvious conclusions speculation if you wish. What datasets make up your observations? I think your definition will be unduly restrictive. Hence your inability to see beyond ENSO to a greater truth. Why are you asking that I define the term “dataset”, other than to avoid answering the question? Stephen Wilde: Oops. I noticed the typo after I hit “post comment”. You’re waisting my time, should read, You’re wasting my time. Now, is it unreasonable to suppose that at solar max the increased UV creates ozone which absorbs UV and warms the stratosphere, causing increased flow of warm stratospheric air toward the poles and creating a warm-above-cold temperature inversion (known to be stable)? I think Steven Wilde’s “conjecture” makes a lot of sense. But Bob, you don’t call them datasets, apparently. Just one correction, though it doesn’t alter the underlying principles, but oddly the stratosphere gets warmer when the sun is LESS active rather than when it is MORE active. I’ve made separate proposals to try to account for that and I await more data about stratospheric and mesospheric temperatures since 2007 before I can firm up that aspect. The year of solar max for cycle 23 was 2000. Current temperatures are almost a degree lower than those at solar max. But this is not a big difference and certainly not the whole story. I encourage you to continue your inquiry. Any idea as to why they should differ ? Please show me a graph on that webpage that confirms this quote. Please identify the cloud cover dataset which serves as the basis for the quote. Please quote the discussion of the equatorial Pacific cloud cover for the 2010/11 La Nina from the link you provided, which is the topic of discussion here. The Earthshine data in Palle et al (2006) ends in 2004, but our discussion is of the present, the 2010/11 La Niña. You’re assuming the global cloud reflectance has continued to increase since 2004. Big assumption. Please also enlighten us as to how you can determine meridional and zonal changes in cloud cover from Earthshine data. You have not provided links to the data upon which you are making claims about the present state of cloud cover. Webpages or papers that do not substantiate your quotes and that are outdated for our discussion do not serve as data. Your work is invaluable and I admire it greatly. My approach differs from yours, clearly. You rely only on specific demonstrable data whereas I look for trends and relationships between bits of data that might not yet be final and conclusive. I see no good reason for the unpleasant tone that our exchanges have acquired. If I question certain aspects of your work it is not intended as a personal attack. You are the expert par excellance on all matters ENSO. I am looking at the broader and longer term issues and in order to do so I need to draw conclusions from less than perfect data. You say that the cloudiness over the ENSO recharge area is ‘normal’ and that recharge rates are ‘normal’. Others say otherwise. On balance I am inclined to believe you rather than them but I reserve my position and await confirmation one way or the other. The thing is that the issues I address are at the heart of the question as to whether anthropogenic influences are significant or not. Your data does not address that issue either way as far as I can see but it does provide some basic assumptions that I can use as a starting point when I seek to interpret the implications of data from outside the ENSO regions. So, it is up to you as to whether we can help each other or whether you find my style so different to yours that no integration of our respective approaches is possible. I do not take them as personal attacks. I view your conjecture as conjecture, and when your conjecture is not supported by data, I advise you. And occassionally, I ask for you to document your claims with data, which you consistantly fail to do. There is data. You elect not to use it. Since you do not rely on data, your speculations can not address whether anthropogenic influences are significant or not. I have addressed the rise in temperatures outside of the ENSO regions in a good number of posts for over two years and how much of it are aftereffects of ENSO. 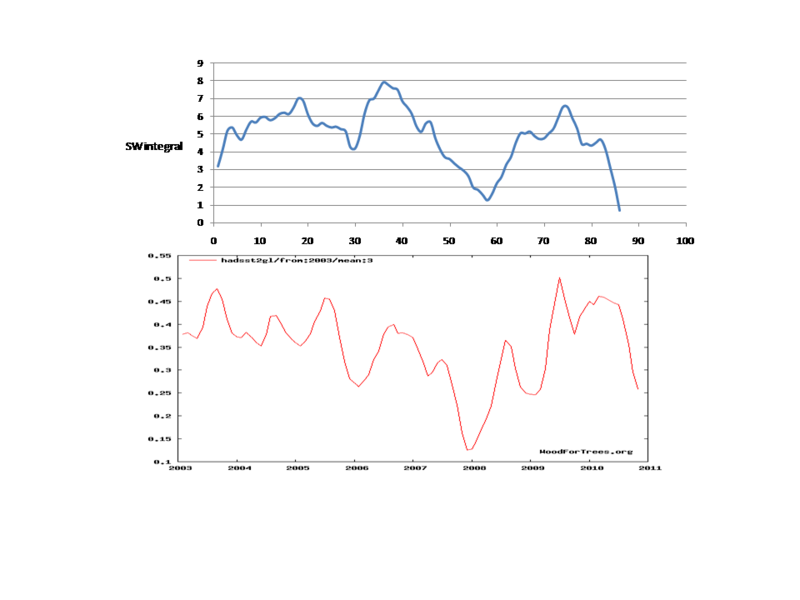 Here is a plot of solar flux vs arctic oscillation. Nothing is proven, but the plot is suggestive nevertheless. These are 11 year smooths, normalized. Note that the flux curve does not peak at solar max, and this was not intended. The smooth is to average over a given solar cycle and only indicates general level of solar activity. Solar max and min by sunspot counts are indicated. I continue to believe that solar effects on the arctic oscillation may have an important effect on climate. However, much more data is needed and there are many other important factors involved. As for the Li and Weng paper you referenced, one can make of fig 4 what one wishes. I remember being impressed by the rapid cooling of the stratosphere in the ’90s which I thought was the only real observable due to CO2 (more radiating species in the upper atmosphere). The only comment I would make after looking at fig 4 is that the rapid cooling has stopped. For those still following this thread, there has been a very large switch in the SSTs in the East Pacific off Peru. Temps have increased by 6C in the last month. The US Navy model NLOM has this warmer water coming in from the Peru-Humbolt current and it looks to me like the La Nina is now very rapidly dissappating. A strong El Nino is on its way sooner rather than later. The equatorial surface currents are now going west-east over much of the Pacific. And the Trade Winds are strongly west-east in the east Pacific and mostly normal in the rest of the Pacific (after having reached record east-west levels in December). I think the main confounding effect is oceanic. Thus when we have a period of La Nina dominating over El Nino as during the mid 20th century cooling period the oceans fail to push the tropics poleward so the AO is able to remain less positive than it otherwise would be from solar influences alone. The positivity of the late 20th century would then be a consequence of solar activity causing the vortex to intensify from above and the warm ocean surfaces pushing the tropics poleward with both factors supplementing one another. During the mid 20th century the slightly weaker cycle 20 (but still high in historical terms) led to greater AO negativity than would have been expected from the activity level of cycle 20 alone because the cool ocean surfaces allowed the tropics to contract. Additionally it isn’t just ENSO/PDO that is the final arbiter but the net state of all the global ocean surfaces combined. So the pattern varies a good deal so as to disguise the underlying mechanisms on timescales less than the multidecadal. That will be interesting if it happens because it would entail the start of a discharge phase much earlier than was expected and before a full recharge has taken place. It might warm the air up a bit for a while but would deplete ocean heat content prematurely perhaps leading to a downward step in air temperatures between the current La Nina and the next. It might force a more positive AO too by pushing the air masses poleward against the negative AO trend supplied by the relatively inactive sun. The 10.7 flux is up a bit from the recent solar minimum so that suggests a little less AO negativity too. Yes I accepted the stratospheric cooling back then as evidence in support of the CO2 theory. But since 2000 CO2 levels have continued to rise and the stratospheric cooling stopped which tends to suggest natural causation, possibly solar induced.